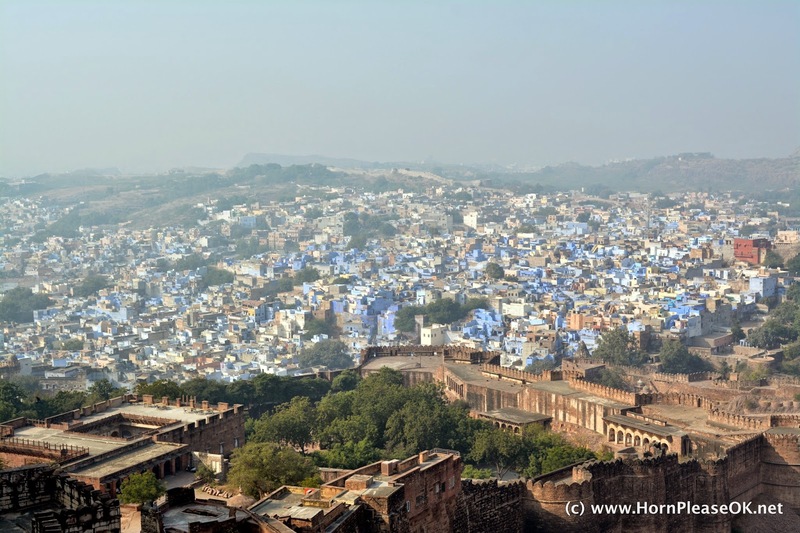 Rajasthan : Jodhpur, The Blue City | Horn please, OK? An aerial view of Jodhpur made me think of a pixelated sea. A vast stretch of houses painted in varying shades of blue. The Blue City gets its descriptor from the blue that spreads through the horizon. There are a few theories to how this came about. Being a city close to the desert its inhabitants did all they could to protect themselves from the sun. They mixed indigo with whitewash and coated the exterior of their homes with the mixture. This colour and pigment said to have reflective properties kept the interiors cool. 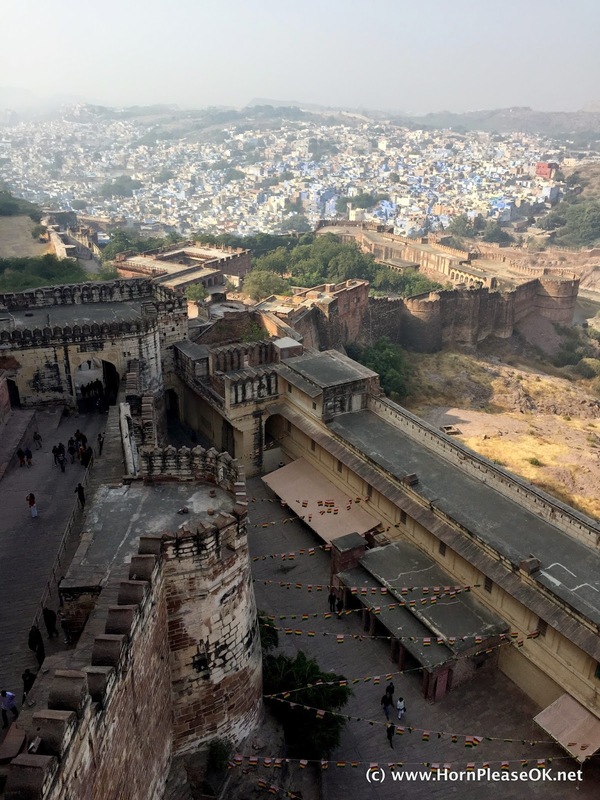 Another theory says that the town of Jodhpur, like many others in India, was divided into quarters depending on the trade of its inhabitants There was a quarter occupied by merchants, another by blacksmiths, one for tailors and so on. Blue was used by the Brahmins to distinguish themselves from the rest. 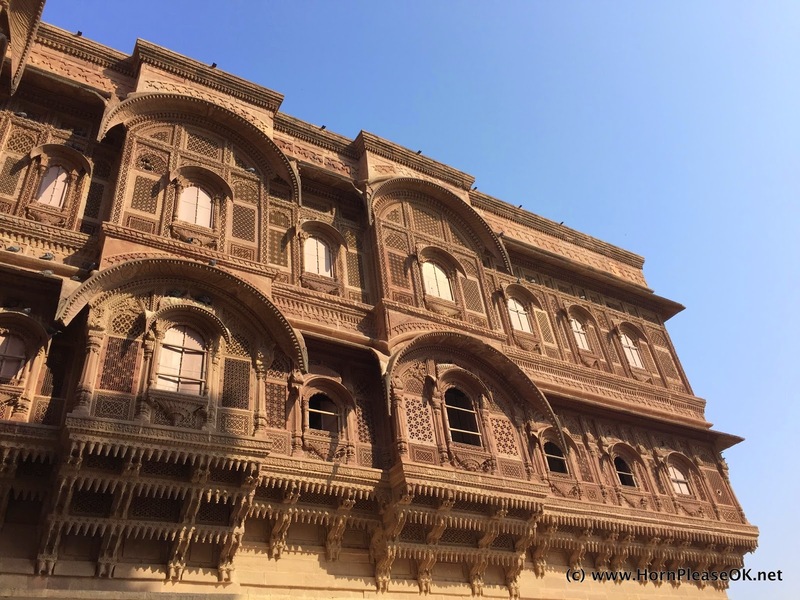 We had a day to explore Jodhpur, not an easy task. So we picked 3 places and set off to make the most of it. 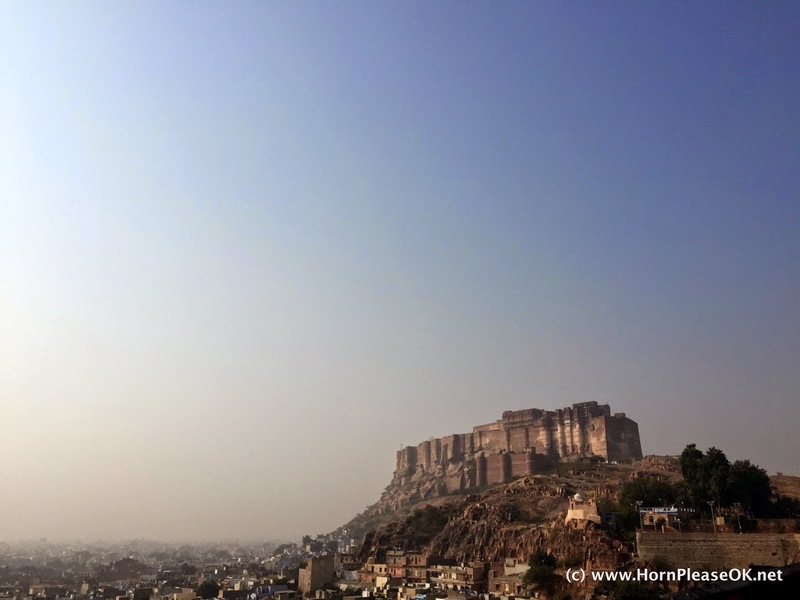 The approach to Mehrangarh fort is through a narrow road that pushes its way through a crowded city bazaar. So crowded that when a fruit seller pushed his handcart in to our car we didn't have space to open the doors to check the extent of the damage. Travel tip : Try and get to the fort as early in the day as you can. It'll help you avoid the traffic jam to get in and find you a parking spot that doesn't involve a hike. The road leaves behind the crowds and winds its way up a hill. Bends on the way gave us fleeting views of the blue city stretched out below. The first glimpse of the fort standing tall astride blocks of chiselled rocks made us stop the car and step out. 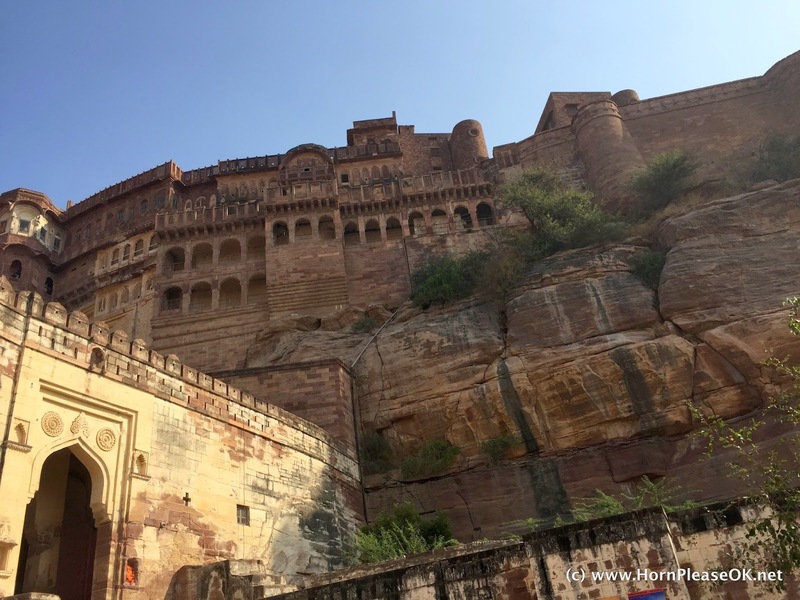 Mehrangarh fort is one of the better organised tourist places we've visited. Signposts and markers everywhere, well informed folks manning the counters and clean restrooms. A fully functioning cafe was the cherry on top. 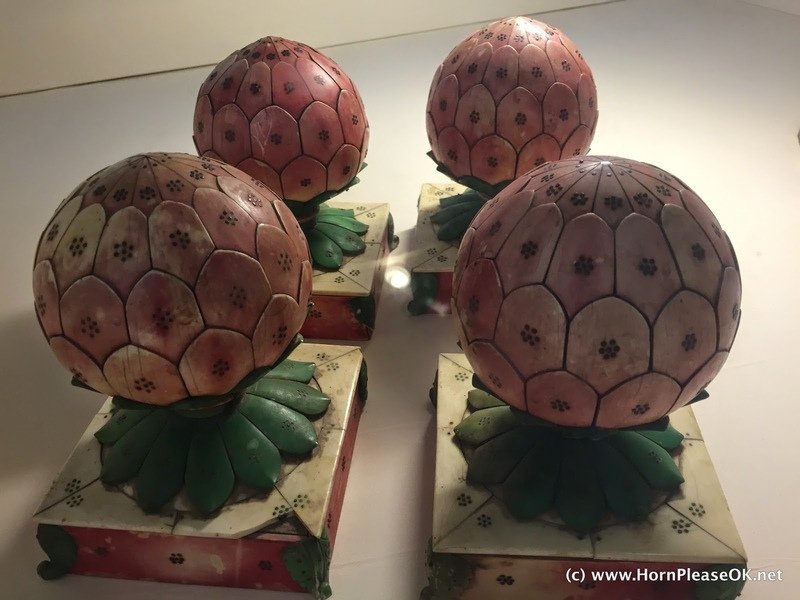 Currently more museum than fort, it tells a good story of the cultural history of Jodhpur. Travel tip : Plan to spend an entire day at the fort. Apart from exploring its museums and palaces you can indulge in some Zip lining. 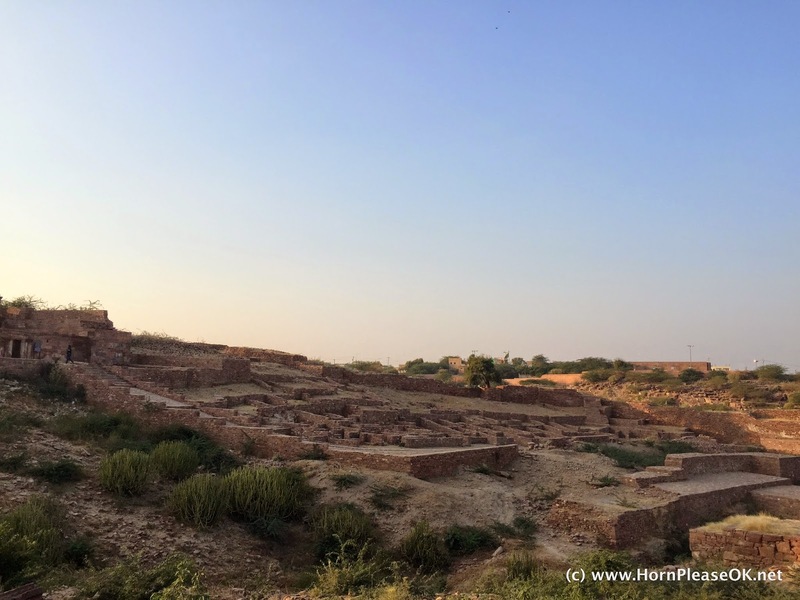 The state of Marwar was ruled by the Rathore clan from the old fort at Mandore, 9 kms away. 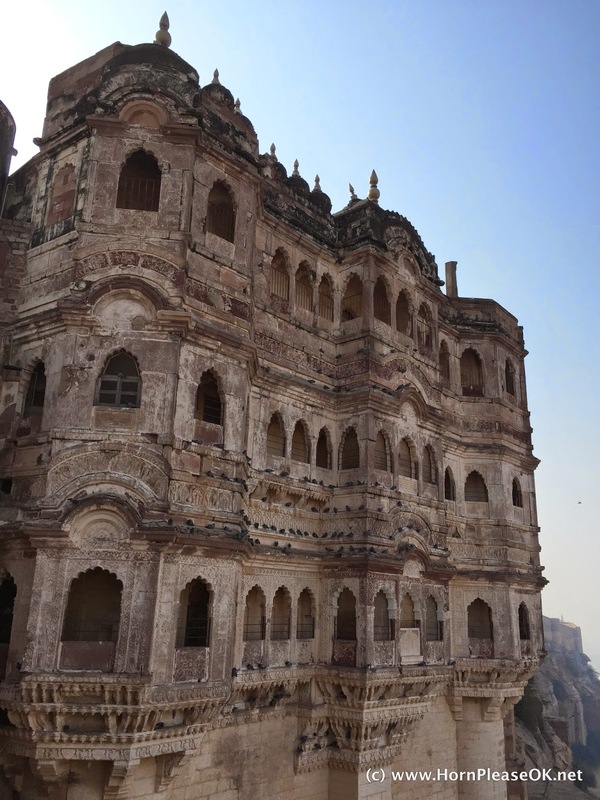 In 1459 Rao Jodha the 15th Rathore ruler laid the foundation of the Mehrangarh fort, or Mihirgarh as it was originally called, and moved his capital to present day Jodhpur. The fort walls extend over 5 kms and are as high as 120 ft in some sections. Built on a bedrock of volcanic rock it rises 400 ft off the ground. All of it apparently cost Rao Jodha 900,000 rupees to build. 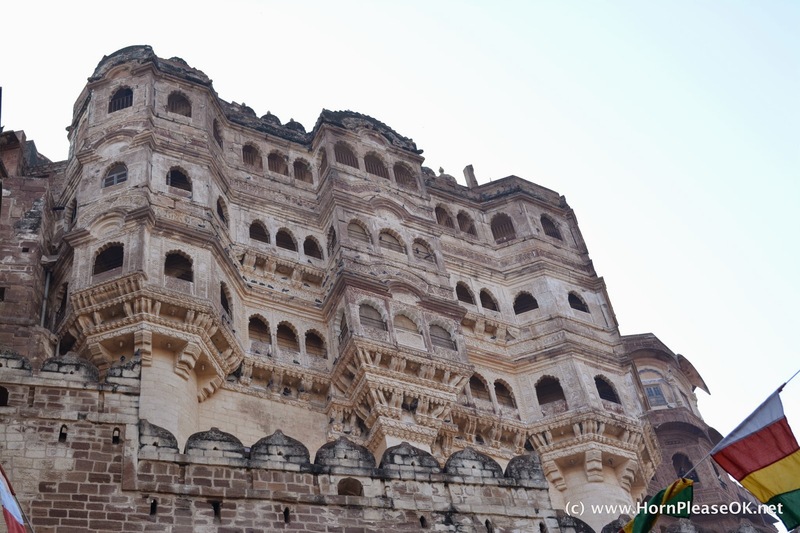 Like most forts in India Mehrangarh has a colourful history steeped in folklore mixed with a healthy dose of facts. The hill on which the fort was built was called Bhakurcheeria, the Mountain of Birds. Its sole inhabitant a hermit, upset at being being displaced put a curse on the fort condemning it to perpetual drought. As a workaround (and medieval Indian kings were notoriously good at coming up with these) Rao Jodha sacrificed one of his subjects, a volunteer who agreed to be buried alive in the foundations of the fort. The King in return offered to take care of his family and descendants for all eternity. It is believed that the King kept his word. 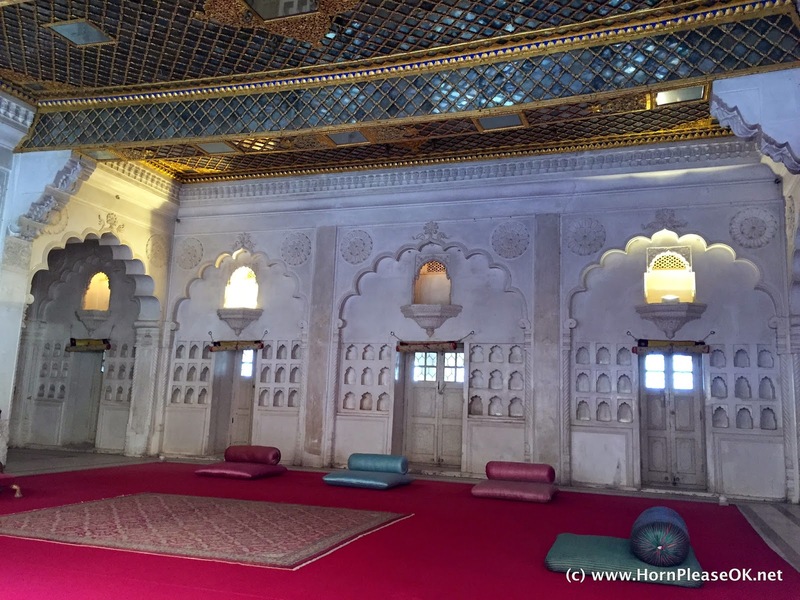 Enclosed within Mehrangarh fort are some exquisitely designed palaces, temples and shrines built over 500 years. 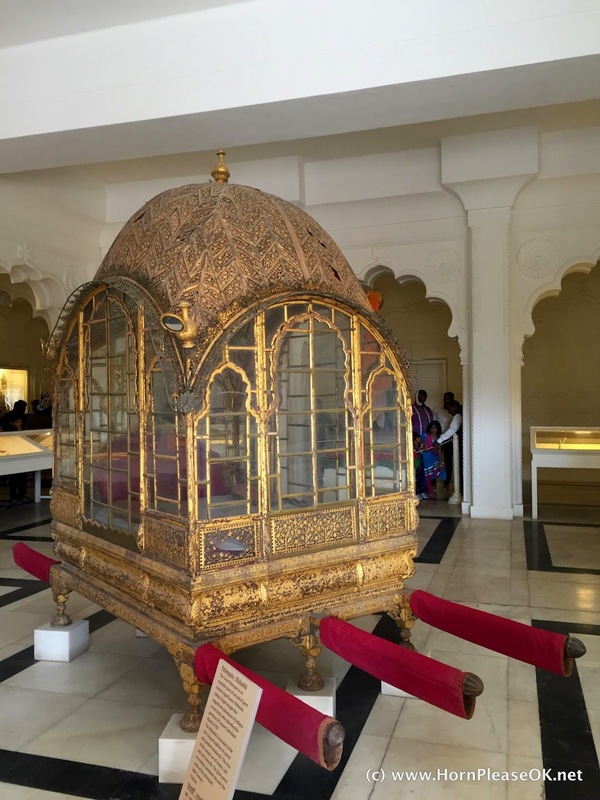 Some of the palaces have been converted into museums displaying mind bogglingly rich artefacts like palanquins made out of silver and gold, armaments and art. In stark contrast to its old world charm stands an elevator constructed to carry visitors 120 ft up to the top. Thats where we started our walk around the fort. The tradition of Purdah amongst the Rajputs influenced the way architecture evolved. They had to keep their women away from prying eyes and yet provide them with a way to see what was happening outside. 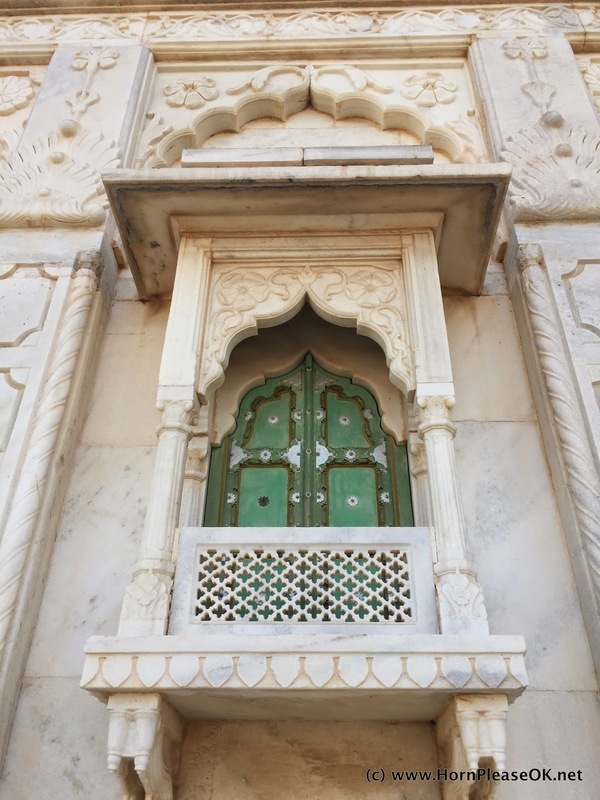 Intricately carved sandstone panels that could dupe you into thinking they were made out of wood served as screens for the Rathore queens to look out from. Howdahs are elaborate saddles used to ride elephants. They were often designed to include motifs or a coat of arms of the dynasty to which it belonged. 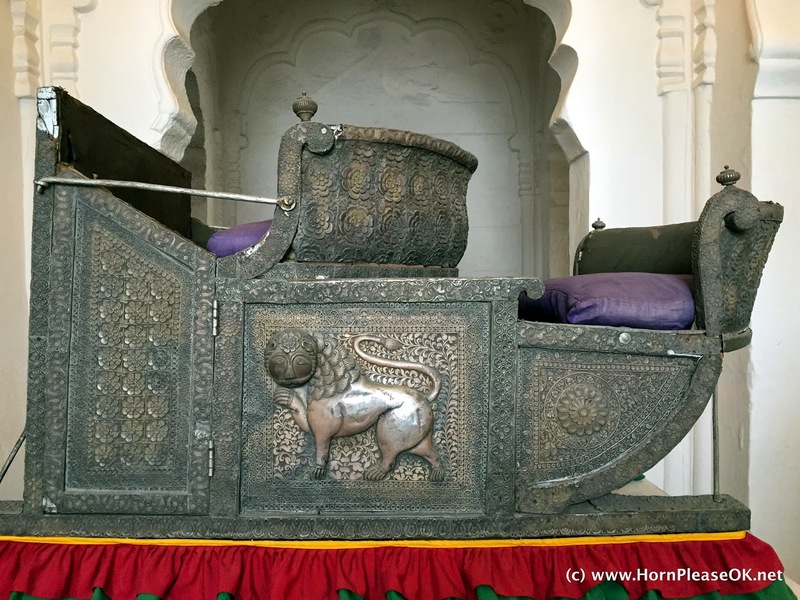 This howdah was gifted by the Mughal King Shah Jahan to the King of Mewar. The museum holds lots of interesting things that have no utilitarian use today but were clearly items of everyday use back in the day. The Moti Mahal was used for discussions on administration and policy. One of the Kings was said to be more egalitarian and less sexist than the rest of his clan and allowed his queens to listen in on the discussions from a covered balcony. Behind each door stood a handmaiden who would carry queries from the queens to the King and his ministers. And that was more representative than the 33% quota we have for women in parliament today. 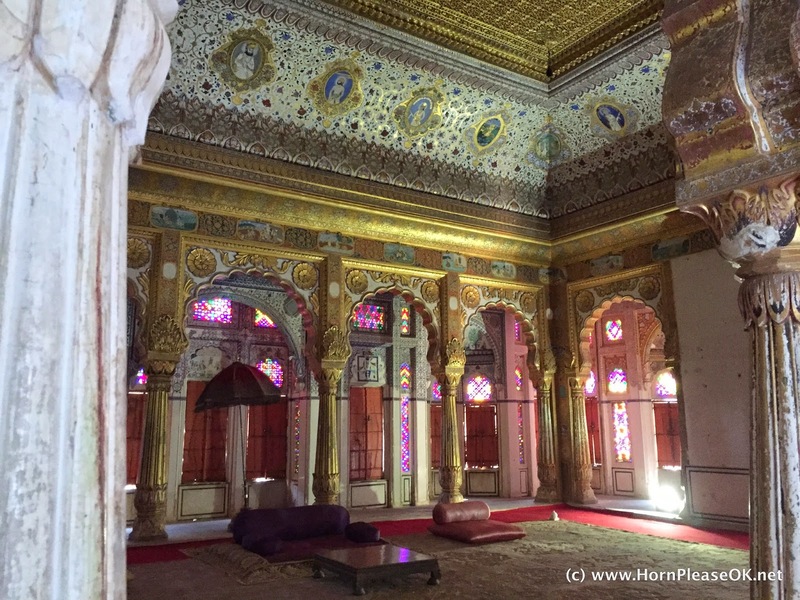 The Phool Mahal is what fantasies are made of. 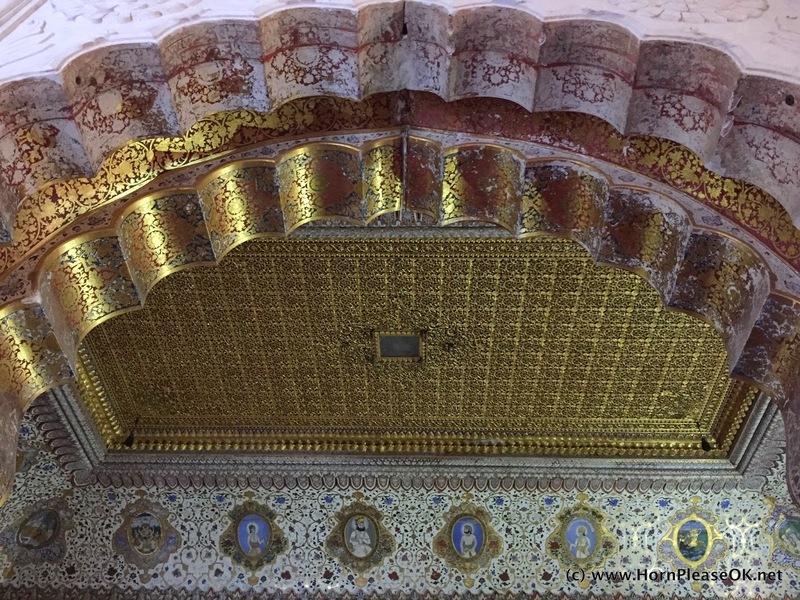 The ceiling is covered with thin gold sheets made from 80 kgs of pure gold. Sunlight filters through coloured glass in the windows to form patterns a kaleidoscope can only dream of making. This is where the King read poetry and listened to music. Mehrangarh fort has 7 gates (or pols) marking the entrance into the fort, each with a unique story. One of them has imprints of more than 30 hands covered in vermillion. These are said to belong to the queens of Maharaja Maan Singh, who committed Sati. Another gate has marks from cannon balls lobbed at the fort during an earlier attack. 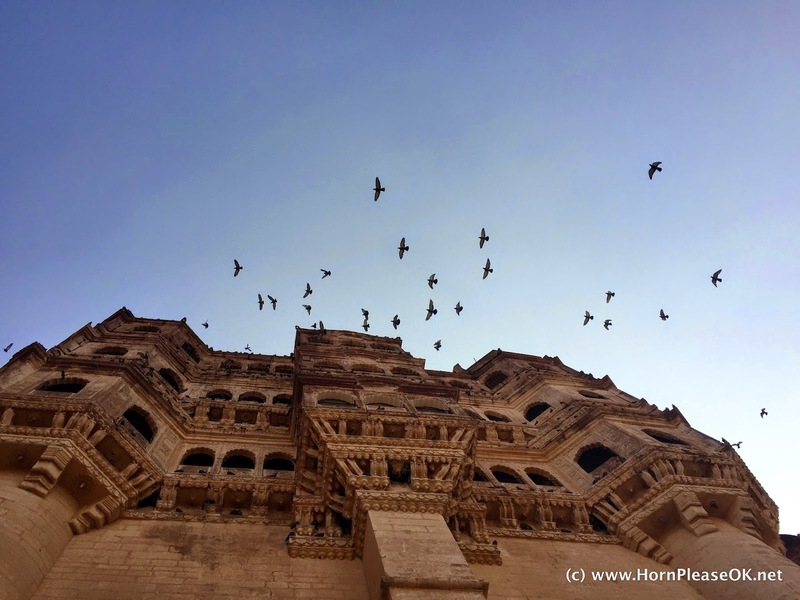 Mehrangarh has a rich history full of intrigue, valour, betrayal and patricide. But what really sets it apart is this. 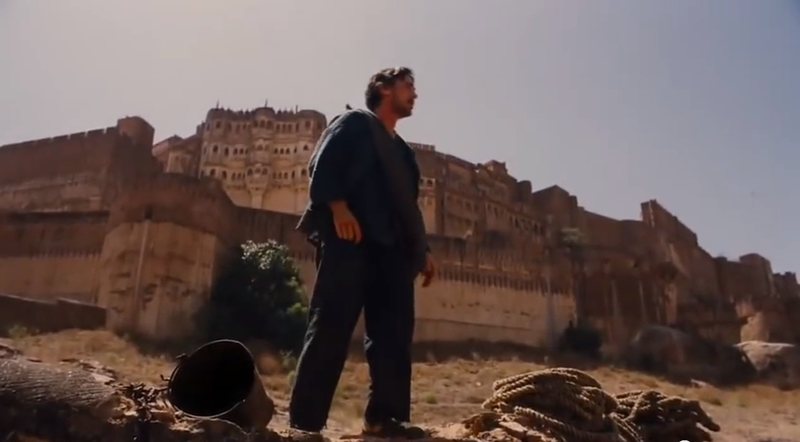 Yes, thats Christian Bale climbing out of The Pit running towards Mehrangarh fort in Christopher Nolan's The Dark Knight Rises. I bet Rao Jodha didn't see this one coming. From the top of Mehrangarh fort, we spotted a beautiful white structure in the distance seemingly floating on a lake. "Its Jodhpur's Taj Mahal", said our guide. The Rajput kings' prolific building of cenotaphs has ensured that no city, town or village in Rajasthan is spared of these strange yet beautiful monuments. 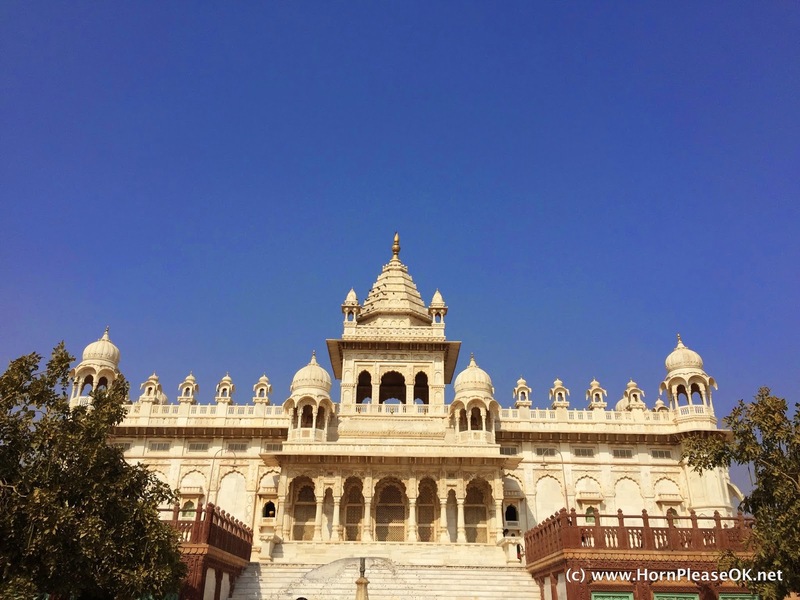 Jaswant Thada was built in 1899 to honour the memory of Jaswant Singh II by his son Sardar Singh. The main structure is made of beautifully carved white marble. It holds two other tombs to kings from the Rathore dynasty. The cenotaph looks more like a Mughal mausoleum than the memorial of a Rajput King. Mughal architecture had such a lasting influence on Rajput art and architecture that its difficult for a layman to tell them apart. 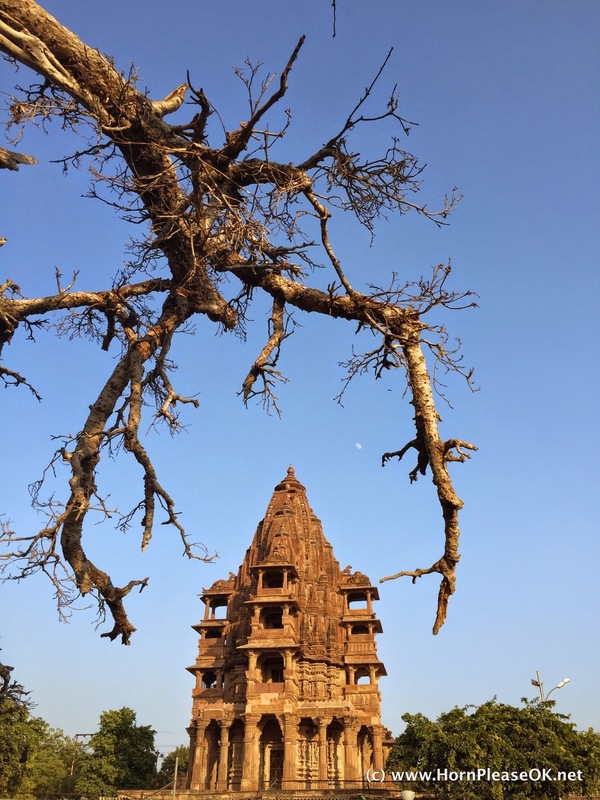 As a friend pointed out from our pictures, the carvings include both an inverted tree of life (a quintessentially Mughal motif) and open lotuses (a Hindu symbol). You would expect memorials and tombs to be spooky but this cenotaph emanates a serenity otherwise found in a place of worship. 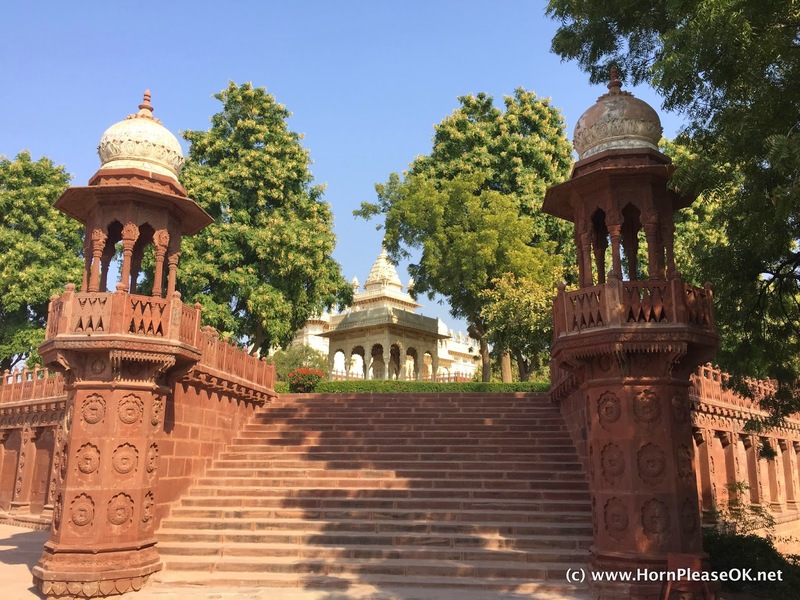 When researching what to see in Jodhpur, we'd come across a recommendation for Mandore Gardens. From the description it sounded very much like Delhi's Lodhi garden; an open green space in the heart of the city, dotted with tombs. We almost struck it off our list in favour of something more historical. That would've been a big mistake. Mandore was the erstwhile capital of the state of Marwar. It had been given as dowry to the Rathore King Rao Chunda who ruled from here some time after the 12th century. Before it became the capital of Marwar, it used to be part of the Gurjar Pratihara kingdom and an important centre of art and architecture. The gardens are well maintained and full of families ignoring signs not to feed the very high spirited langurs. Every few hundred metres we'd find buskers playing a haunting tune on a stringed instrument which we later found out is called a Ravanhatta. Walking past the picnicking crowds we walked into a cluster of temple like structures. 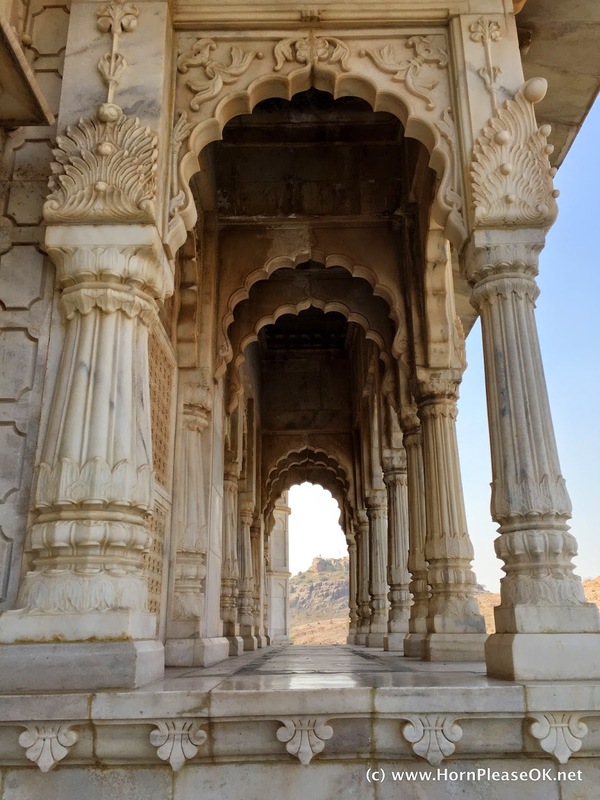 They were cenotaphs built in memory of the Kings of Marwar. 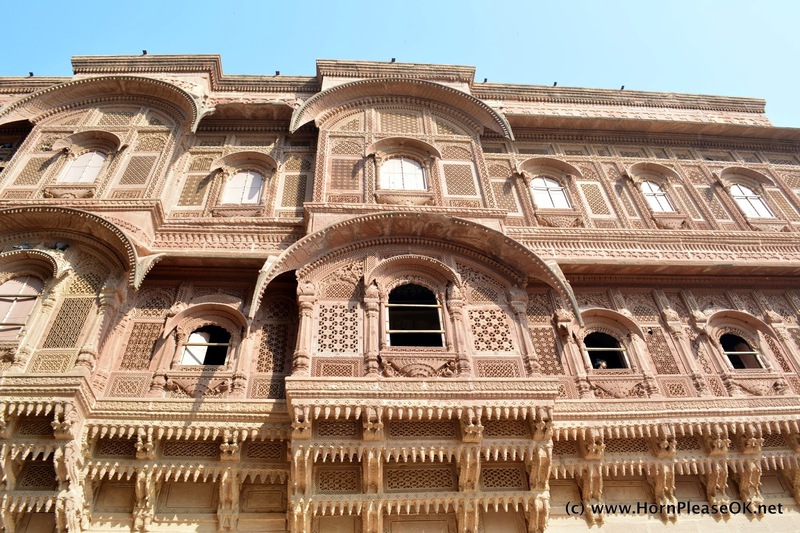 Very different from Jaswant Thada, these were made of red sandstone and had a much more gloomy feel to them. And unlike any memorials we'd seen so far, these had multiple levels. The tallest one was a 4 tiered structure in memory of Maharana Ajit Singh, one of the bravest rulers of Marwar. There's a beautiful painting by AH Muller of the infant king being carried into the forest by his father's lieutenant Durgadas. He was being taken away in order to be protected from the Mughal Emperor Aurangzeb. Ajit Singh grew up and consolidated the Rajput clans against the Mughals and wrested control of Marwar from Aurangzeb. Perhaps the height of the cenotaph is a testament to Ajit Singh's valour. Further explorations revealed temples and ruins of an old fort. This was where Marwar was ruled out of! Excavations had revealed sculptures dating back to the 6th century at the site. We took a short walk through the ruins and found pieces of carved lintel and column bases scattered everywhere. An ASI team was hard at work restoring the fort. Its supposed to be thrown open to the public by the end of the year. 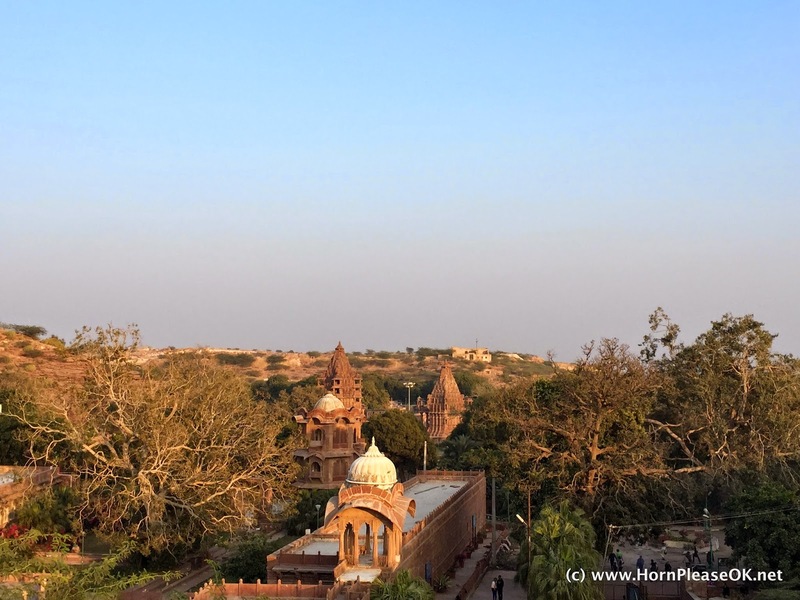 The contrasting capitals of Mandore and Jodhpur tell an interesting story of the evolution of architecture in the state of Marwar. Standing at the top of the ruined fort and looking down we felt like we'd been given a preview of the prequel to a historic epic.